If you are installing it for the first time, navigate to https://aka.ms/wtsinstall, click download and once downloaded, double click the VSIX installer to start the installation process. In case you have an older version of Windows Template Studio already installed on your development environment, Visual Studio will auto update the extension. To force the update process, go to Tools | Extensions and Updates | Update | Windows Template Studio. Then click the Update button to continue. What's new and improved in this build? URI Schema launching for Caliburn.Micro added. Tweaks for consistence across all frameworks and languages. Fix for bug where we have a toast and first time prompt crash. Lots of under the hood bug fixes and code improvements. Changed how we handle verifying new templates. This process should be much faster now. Improved unit testing for verifying templates. 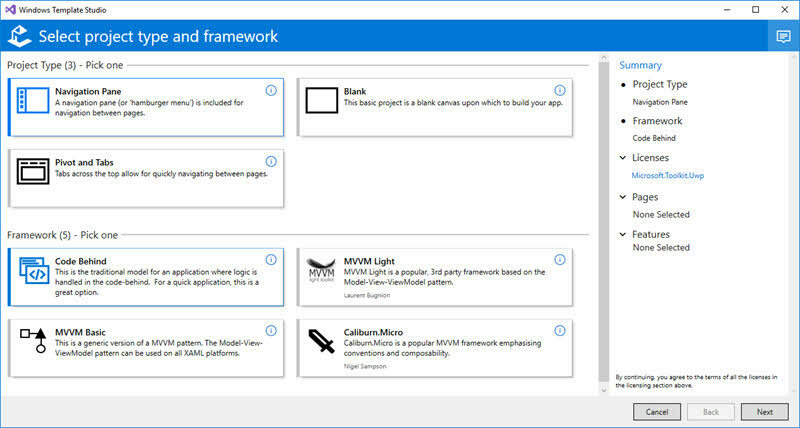 If you have come this far, it means that you liked what you are reading (Windows Template Studio version 1.7 is now available).